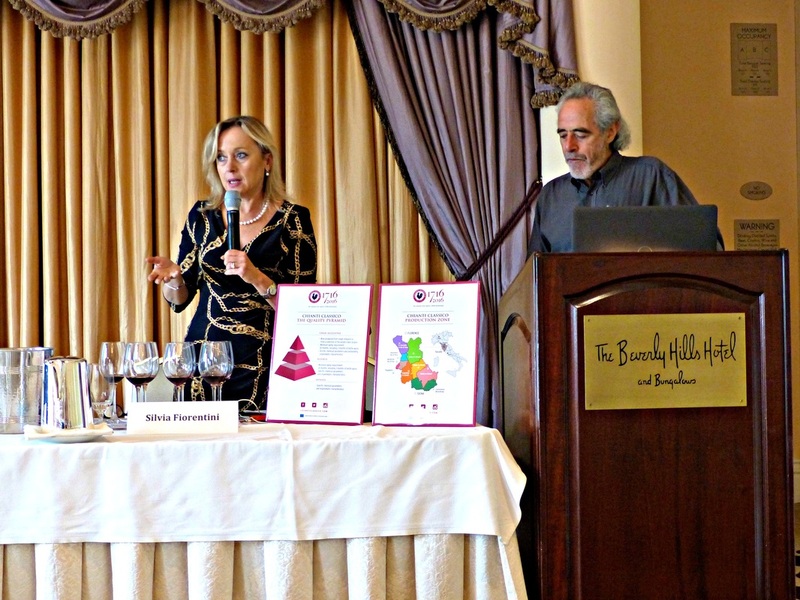 The “Chianti Classico Introduces its Top Tier Wine: Gran Selezione” seminar, presented by the Consorzio del Vino Chianti Classico, explored the quality pyramid of Chianti Classico. Peter Koff, Master of Wine, who was joined by Consorzio Marketing Manager Silvia Fiorentini, took a closer look at a truly classic wine. If you thought you knew Chianti Classico, think again. Although Chianti Classico, best know for its Black Rooster on the wine labels, is celebrating its 300th anniversary of its historical roots this year, producers are still defining quality among the wines. Classico makes up only 10% of the total vineyard acres in the region, and the wines produced fall into the categories of 73% vintage, 23% riserva, and the top tier, 4% Gran Selezione. Gran Selezione is taking it to the next level, made from the winery’s best estate grapes or a single vineyard, with longer aging requirements, a minimum of 30 months between barrel and bottle, and stricter adherence to what is called a unique “Sangiovese signature” of aromas, flavors, and structure, shared by nine communes in Chianti. These sensory characteristics add nuances to Gran Selezione wines, which are by DOCG regulations 80-100% Sangiovese, that set them in a class by themselves, defined as “fruity, spicy, enveloping, where elegance, fineness and balance of the tannins and acidity maintain the characteristics of fusion and of wholeness”. 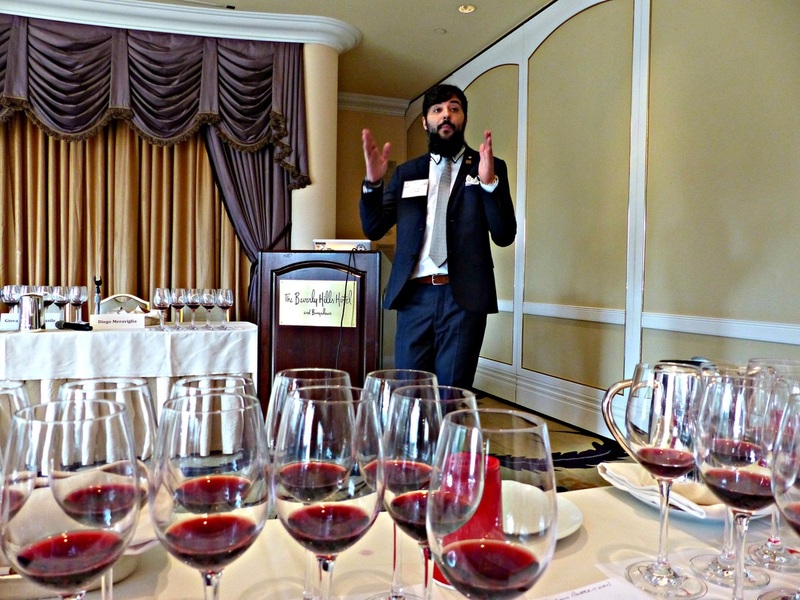 As Koff notes, “it’s not easy to make Sangiovese wine great, but there is an elegance when you make it in the right place, a complexity, Sangiovese does things that Cabernet Sauvignon doesn’t”. 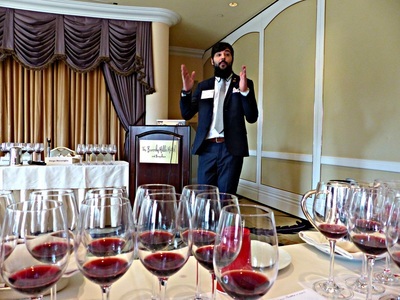 Koff believes that “Sangiovese trumps Cab, making it look pedestrian compared to Sangiovese”. And in that vein, producers are aiming to make Gran Selezione the Bordeaux of Italy, reflective of terroir. Chianti Classico producers now number 566, of which 100 are involved with making Gran Selezione, and required to announce ahead of time their intent to produce this top wine. It’s a concerted effort to differentiate between Riserva and Gran Selezione, and elevate this shimmering jewel of Sangiovese to the world stage. Seven wines were tasted, all beautiful examples of the aromatic complexity, depth of flavor, refinement and balanced structure that makes this category of Chianti special. Vintage years matter, as demonstrated with this tasting. A cool weather 2013 was represented by four wines: Banfi Fonte alla Selva, Villa Calcinaia Vigna Bastignano, Castello Vicchiomaggio La Prima, and Principe Corsini-Villa Le Corti Don Tommaso, all elegant wines that were balanced and complex. The 2012 vintage was a warm year, represented in the best wine of the group, the Rocca Delle Macìe Riserva di Fizzano, 95% Sangiovese and 5% Merlot, intense and spicy, with ripe fruit and elegant body, intertwined with fine tannins. The 2011 vintage was an early harvest, with lots of heat, but still yielded a very good Bibbiano Vigna del Capannino, 100% Sangiovese, a fruitier, more floral wine with velvety tannins but not as well integrated as the 2013s. The 2010 vintage was classic, a cooler harvest that produced wines that are age-worthy, such as the Fèlsina Colonia, an earthy, concentrated, vibrant wine that will continue to improve over time. 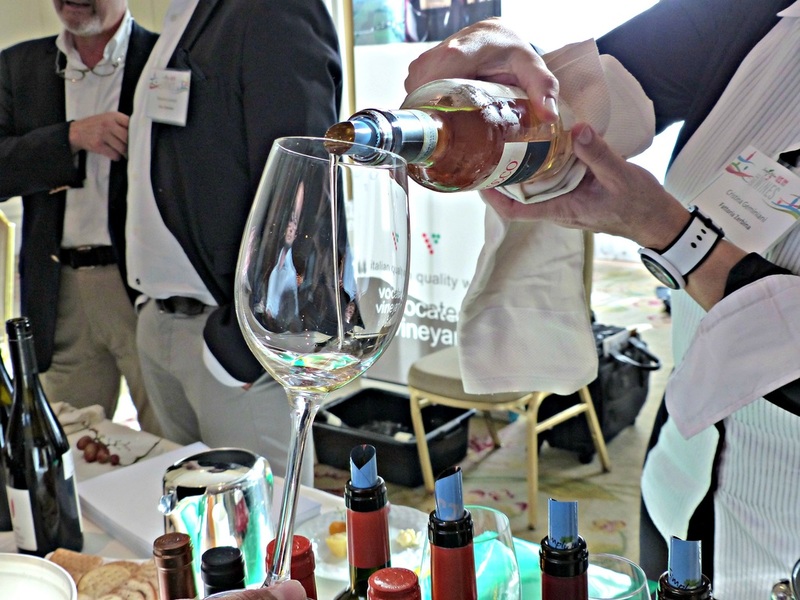 The “Romagna: Albana to Sangiovese, Journey into Native Varietals”, presented by the Consorzio Vini di Romagna, introduced the little known wines of Romagna. Sommelier Laura Donadoni, Wine Educator Giammario Villa, and Filberto Mazzanti delved into the region, historically known as Emilia-Romagna, and explained, “This is one region, with two souls, and two traditions”. Ancient trade routes converged through Romagna during Roman times, and it became the link between Northern and Southern Italy. Here, food and wine traditions of this hyphenate separated themselves; Emilia, with 2/3’s of the land, geared its cuisine around butter and animal products; Romagna, producing 65% of the wine, focused on olive oil and vegetables. Although not well known in the US, Romagna produces a lot of wine, white and red, and is Italy’s second largest wine producer, right behind the Veneto. The outstanding Romagna Albana was a delight, Italy’s first DOCG white wine, with peach and apricot fruit, floral, acacia honey, and almond notes. Albana is made in four styles, its good acidity and residual sugar can make delicious dry and sweet wines. Sangiovese is the primary red wine. Ten wines were tasted, four Albana and six Sangiovese, with winemakers introducing their wines, all delivering excellent bang for the buck, beautiful wines that drink twice the price. All the Romagna Albana wines were from the 2015 vintage, the Fattoria Zerbina Bianco di Ceparano was a standout, with its floral highlights, white peach, kiwi, and lychee fruit notes, and a yeastiness to the medium body, it’s vibrant, mineral, fresh, and lively on the finish. The Trerè Arlus delivered a little more weight, but still so delicious with its riper fruit and bay leaf herbal note; the Podere La Berta Albana very aromatic and ripe, with honeysuckle and pear notes layered on the persistent finish; and the Celli I Croppi smooth and structured, with a bit of astringency that added interest, alongside its apricot, tarragon, and saffron notes. The Sangiovese ran the gamut, from fruity and floral to meaty and mineral, more fragrant and herbal, less acidic and tannic than its Tuscan cousin. These differences are due to the geology of the region, twelve sub-zones with diverse soils, such as the blue clay and marine soils, that influence the wines. Of the six wines tasted, three were Superiore 2015, denoting higher alcohol and quality fruit; the other three were 2013 Superiore Riserva, designating longer aging requirements and more structure. The Azienda Agricola San Valentino Bacaia Superiore was fabulous, a feral tasting wine of meaty, earthy, clove and cardamom spice, violets and crunchy fruit, organically certified and aged in large oak barrels. 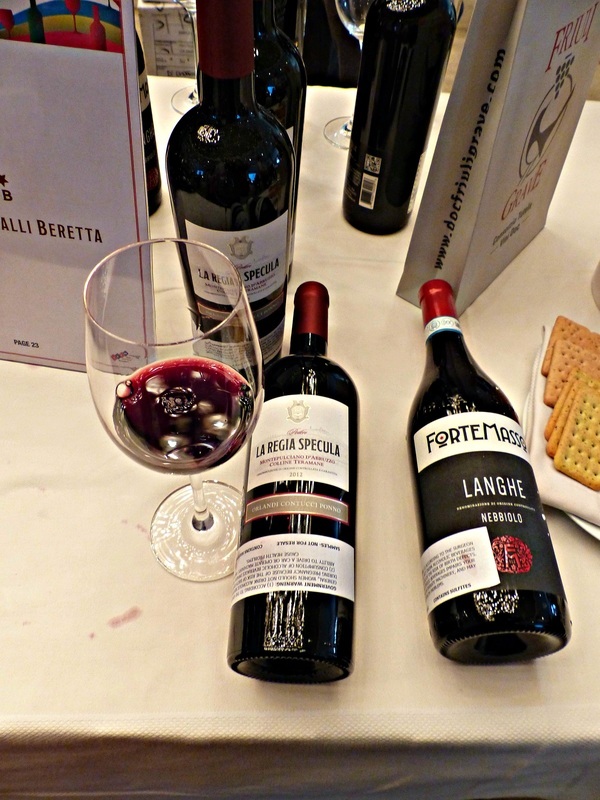 The other two Superiore wines were different from each other, the Cantina Sociale di Cesena Tenuta Amalia Barone Bartolomeo fruity and floral while the Leone Conti Never Walk Alone channeled a mineral, crunchy cherries, fresh herbs, raw meat, and graphite character. Of the Superiore Riserva wines, the Poderi Morini Nonno Rico was a standout, with its black licorice, minty flowers, forest floor, and velvety tannins, followed by the Tenuta La Viola P. Honorii, its candied fruit accented by sweet spice and forest floor, still very young, with a lot of life ahead, and the Enio Ottaviani Sole Rosso, fruity and floral, with blackberry, violet, and oregano notes. 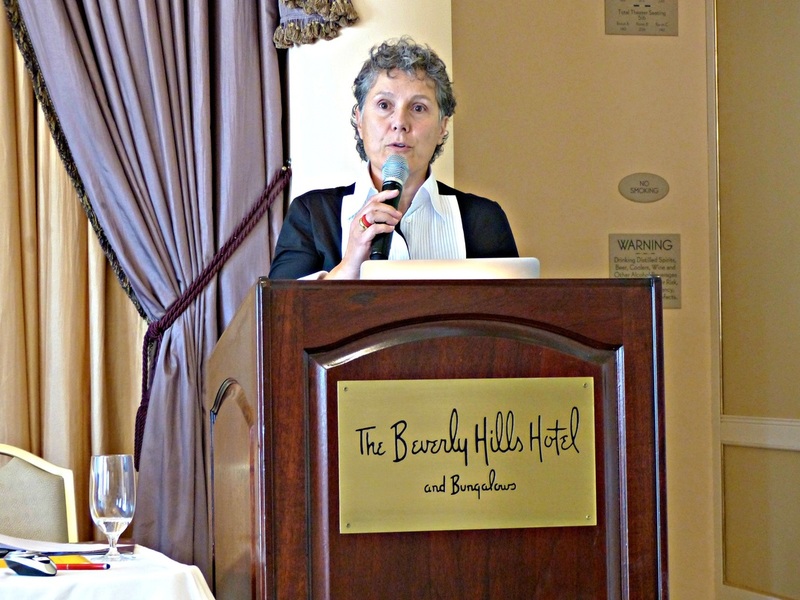 The third seminar, “Morellino & Montecucco: the Latest Gems from Tuscany”, presented by the Consorzio Morellino di Scansano and Consorzio Tutela Montecucco, uncovered the Super Tuscan movement throughout the Maremma. Sommelier/Wine Educator Diego Meraviglia led the charge, joined by Fabio Piccoli and Giovan Battista Basile, and explained that the Maremma is like the Paso Robles of Italy, a wild, sparsely populated area that produces “quality Sangiovese blends for a fraction of the price of Tuscan wine”. Once a marshland, the region was drained, unearthing affordable, prime agricultural land along the coast, that, along with its dry, warm and sunny climate, provides a healthy cradle for grape vines. Morellino di Scansano makes a modern style Sangiovese blend, juicy, round and ripe, lower acid, black cherry-fruited wines from an uniquely different biotype of Sangiovese than Tuscany. The wines, according to Meraviglia, “have less sharp edges, don’t need to age, and are ready to drink”, versatile and balanced. Three tiers of wine are produced, “Fresh”, “First Selection”, and “Riserva”. Montecucco produces aromatic wines with mineral character, from the volcanic soils of Mount Amiata, which are higher in acid and need more aging. Large and small producers employ modern and traditional winemaking methods to craft fine and rustic wines. Twelve wines were tasted, five from Morellino, which were fruity, floral, and balanced, with softer tannins; and seven from Montecucco, which were crisper and mineral, with sharper fruit notes of sour cherry and blood orange, powerful, structured wines that have an iron, gunpowder note woven into the body. 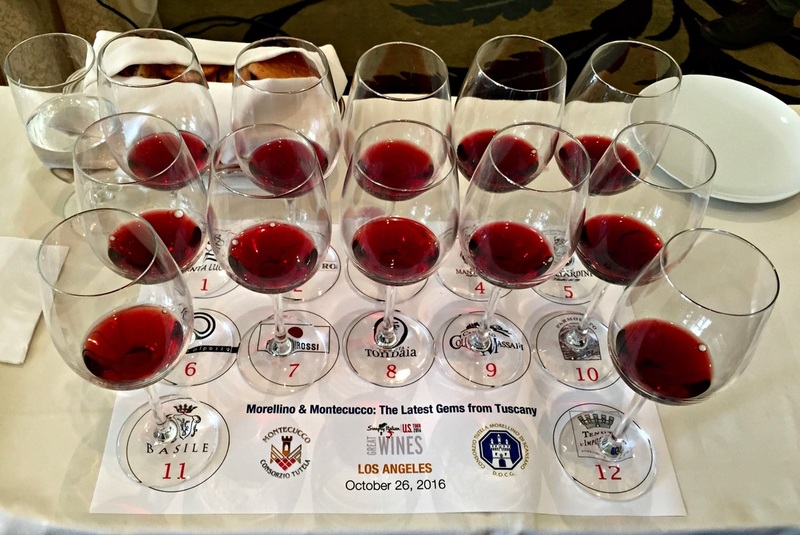 The Morellino di Scansano wines spanned the 2013-2015 vintages, with the 2013 wines more approachable, the Fattoria Mantellassi San Giuseppe mineral and balanced, and the Conte Guicciardini Massi di Mandorlaia I Massi a high quality, complex wine that needs more aging, displaying dark fruit, licorice, cocoa, and leather. 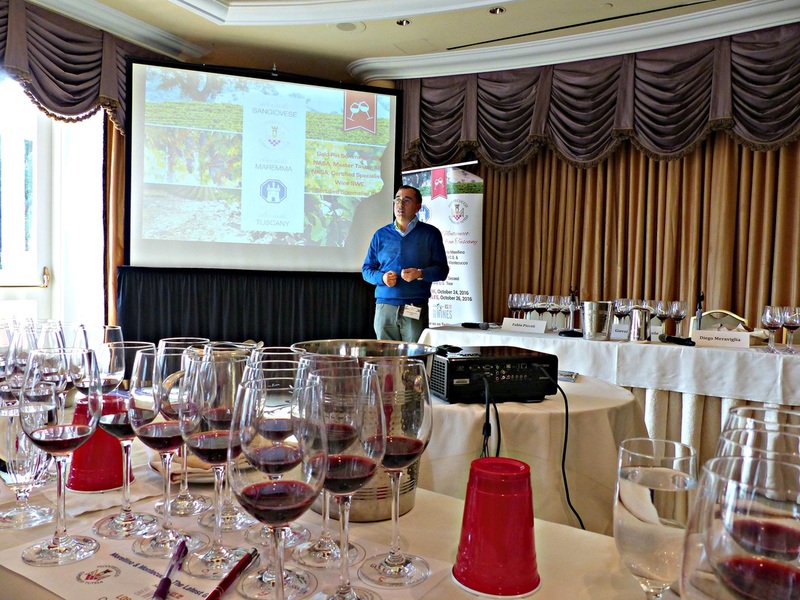 The 2014 wines were fresh and floral, the Poggio Nibbiale Morellino di Scansano almost a floral potpourri, with spice and fine tannins, the Val Di Toro Reviresco, floral, with a bit more tannin, and forest floor. The baby, the 2015 Azienda Santa Lucia A’Luciano offered cherry, dark berry, and plum fruit, floral, with soft tannins. The Montecucco wines covered the 2010-2013 vintages, with four of them 100% Sangiovese wines. Vintage didn’t seem to be the defining factor, rather vineyard site and elevation playing into the very different profiles. 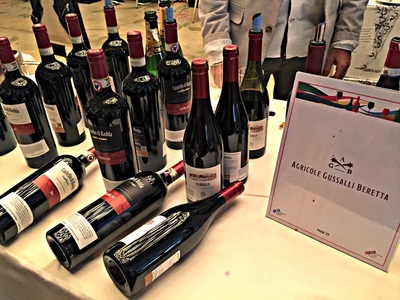 The 2013 wines were all blends, with the Collemassari the most complex, drinking like a Brunello at this point with its structure and gunpowder note. The Prato Al Pozzo Arpagone was sharp and crisp, with dried fruit and hazelnut on the finish, and the Pianirossi Sidus had a fascinating iron note running through the blackberry fruit, similar to the taste of blood, with walnut and anise on the finish. Two wines were from 2012, the Tenuta Tondaia Sass’Alsole was intense, with candied cherry and mineral notes, the Parmoleto very nice, a powerful wine that at the same time was fresh and drinkable, with sour cherry and plum fruit, forest floor, and a rhubarb, root character. An elegant 2011 Basile Ad Agio 100% Sangiovese, was fragrant with tangerine and bergamot, while the 2010 Tenuta L’Impostino Viandante had a volcanic nose, with dried flowers, blood orange, mineral, spice, toasted almond, and ash notes well integrated through the blackberry fruit. While there was limited time to do the walk-around tasting, I will give a shout out to a few producers. I was particularly impressed with Fattoria Zerbina, who poured seven fabulous wines from Romagna, Albana and Sangiovese, with two delicious and superb Passito versions of Albana, sweet white wines that rocked the glass. Zago Agricola offered three Prosecco wines, the Millesimato Brut 2015 a clever and beautiful bottle that when stood on its cork reveals a fizzy wine design on the label. 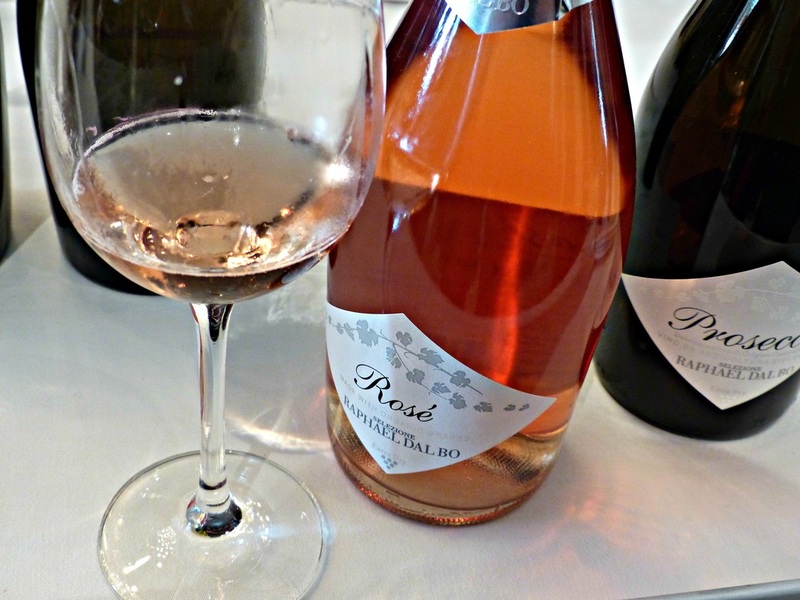 Raphael Dal Bo poured eight Prosecco, fresh and good, with a couple certified Organic, including a Rosé. Società Agricola Castello di Radda Agricola Gussalli Beretta offered a powerful and delicious La Regia Specula 2012 Montepulciano d’Abruzzo. Ending the day on a fun note, a free-form final seminar, “The Sparkling Life: Fresh & Fun Wines from Friuli”, presented by the Consorzio Tutela Vini DOC Friuli Grave, and hosted by Sommelier Nathaniel Muñoz, poured simple sparkling wines from the stony soils of Friuli Grave. The Ribolla Gialla Brut “075 Carati” from Piera Martellozzo was fresh and delicate, with citrus, pineapple, and floral notes. A La Delizia Pinot Grigio “Sass Ter” and Piera Martellozzo Sauvignon “Terre Magre” was poured, light and simple bubbly wines. But the Cuvée Brut “Jadér” from La Delizia was my favorite, a more intense wine, fragrant, floral, and fruity. The surprising conclusions from Simply Italian is that (1) Chianti wines’ quality has skyrocketed, with many fabulous mid-priced ($35-45) bottles, (2) Romagna wines are incredibly delicious, with most retailing under $20, we need to import more of these into the US, and (3) Morellino and Montecucco offer unique Sangiovese wines, some of Italy’s best kept secrets, that are versatile, food friendly, and a bargain compared to the high-flying wines of Bolgheri and Montalcino. And, finally, Italy offers an incredible diversity of wine, meant to be drunk with food, but so many that by the glass are inspirational, and choices abound that can fit anyone’s budget.